Call our pawn shop today for more information! When you need immediate cash, short-term borrowing could be your best way to avoid selling under pressure. Don't give your possessions up - once you sell, they're gone forever. Borrow, and you still own them. You owe it to yourself to investigate our collateral loans. Trade Winds Pawn & Gun opened their doors in 1977 as a full-service pawn shop, serving the Gulf Coast from their convenient Gulf Breeze location about half way between Ft. Walton Beach and Pensacola. FL. Whether you’re looking to buy or sell, Trade Winds can help you with anything from jewelry, hunting and fishing equipment, firearms, and high-grade tools to a variety of knives, flashlights, spotlights and batteries. Stop by our Pawn Shop Today! We are a full-service pawn shop where you can find a wide range of affordable items. We sell musical instruments, jewelry, electrical fixtures, fishing equipment, knives, and more. We serve customers in Pensacola FL and the surrounding areas. If you are specifically looking for antique handguns or rifles, we have a large inventory of superior options. We also buy old items that are eating up space in your home or business. Visit our pawn shop today. Trade Winds Pawn & Gun proudly serves the local Pensacola, FL community. If you have any questions or if you would like more information about the products we have available please give us a call today 850-939-3303! We have a variety of handguns and rifles in stock! Whether you need immediate cash or looking to get rid of some items, we can help you with everything at our pawn shop. We also sell a great inventory of products like handguns and rifles, fishing equipment, electronic items, antique firearm, jewelry, and more. Are you in the market for firearms? We carry a large inventory of firearms including antique varieties. We are one of the pawn shops in the Pensacola FL area! Stop by today if you want to buy handguns and rifles or other pawn items. 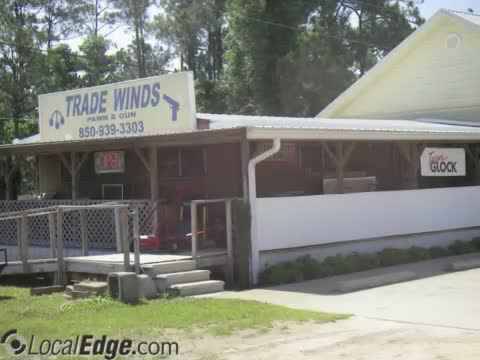 Trade Winds specializes in new, used and antique firearms, as well as black powder arms and ammo. We stock a wide variety and large inventory of handguns and rifles, both for personal protection and hunting. The owner of Trade Winds, Miles Schuler, is always available to offer his expert advice in assisting you with choosing the right firearm for your particular need. We offer quality handguns and rifles at our pawn shop serving customers in Pensacola, FL, and the surrounding areas. The products that we carry are from some of the top manufacturers in the market. So, whether you are looking for a handgun or rifle for protection purposes or hunting, we are here to help you. Our knowledgeable staff and owner are standing by to assist you in choosing a firearm that best suits your needs. There are many variables when choosing either a handgun or rifle, beyond size and type, and Miles can recommend the appropriate selection to fit both you and your purpose. We have over 1,000 firearms in stock, including collectibles, and we welcome special orders. As with most sports and learned skills, instruction, along with practice will only make you better. Miles can recommend some of the best instructors for concealed carry classes, whether you prefer to learn in a large group or a smaller, more personalized group of only two or three. Short on Cash? Want to turn some old jewelry into money? Been struggling lately? Bring your jewelry, electronics or high grade tools in and turn them into cash. Need something now and short on cash? Try our great layaway plans. Need a good hunting rifle? How about some fishing equipment? Come on over to Trade Winds at 6243 Gulf Breeze Pkwy. in FL and check out our inventory. We look forward to seeing you soon! Call us at 850-939-3303 or stop in today for more information! Proudly serving Pensacola, FL! Remmington, Winchester, Browning, Saur, Savage, Colt, Glauck, Marlin, And Many More. We also carry hard to find guns.